The TeleCheck Electronic Check Acceptance® (ECA®) service, one of the industry’s most sophisticated check verification systems, converts checks into electronic transactions to streamline your cash flow and reduce trips to the bank, bank fees and return checks. The TeleCheck ECA service screens each check against information from hundreds of thousands of businesses and financial institutions, instantly providing you with a decision on whether or not you should accept the check and minimizing the risks associated with check acceptance. And with TeleCheck ECA, you return the check to your customers, helping to protect their personal information. Optional TeleCheck ECA warranty service protects you with one of the industry’s most effective check-fraud protection measures. Once TeleCheck has authenticated the validity of a check, the responsibility is transferred from your business to TeleCheck. 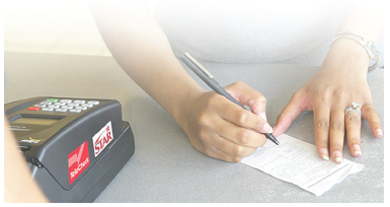 Any returned checks TeleCheck has approved become their liability, not yours.